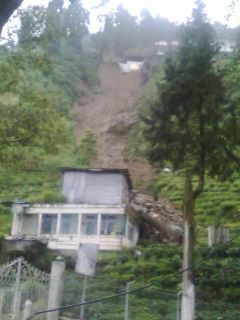 A landslide took place above Happy Valley Estate a place at a distance of around 1 km from Darjeeling market.The continues rainfall since several day and earthquake that took place on 18th of September is the reason for the landslide.The road to Singmari and Lebong has been blocked.The landslide took place around 9:44 at night [Sunday ie;25.09.2011].There is no report of any damages and loss of life but the local residents below the road have been said to leave their houses since the area may be at risk and may cause damages. 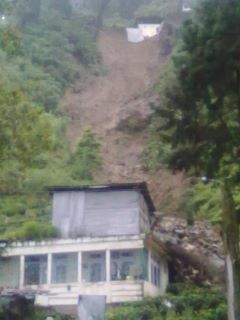 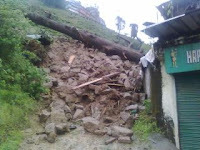 There were many landslides around the area of Darjeeling,Kurseong,Kalimpong during these days due to continuous rainfall,a road from Bijanbari to Darjeeling and road from Bijanbari to Jorethang has been blocked. Several roads at different places has been cracked due to continuous rainfall and previous days earthquke.